One morning I woke up to find that the flowers from some of my vegetables had been eaten. I was not too concerned at first as I thought “oh well, I have plenty of plants, one or two eaten plants is no big deal”. Boy was I wrong. The groundhogs, squirrels, and raccoons did not stop at one or two plants. They decimated my corn, cucumbers, squash and watermelon. There was nothing left. The only plants that survived were my tomatoes, kale, and cayenne peppers. Part way through last summer I tried putting a fence around some of the plants. This had some success, but it was too little too late for most of my plants. This season I am going to pull out all the stops. I have done some research and will follow the tips below to discourage groundhogs, squirrels, and raccoons from coming to my yard. not touch the ground and therefore groundhogs, squirrels, and raccoons just crawl under it. 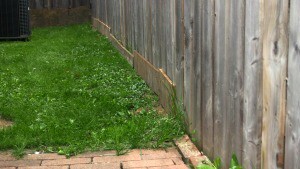 Step one is to ensure that the entire fence is properly sealed so that animals can’t easily enter my backyard. I have covered some areas with additional fencing and other areas with wood or bricks. I used whatever I had available. In addition to beefing up the fence on the perimeter of my yard, I have enclosed my carrots, beets, and beans in their own fences. I call these my “high risk vegetables” as the groundhogs, squirrels, and raccoons seem to be especially drawn to these items. This will also let me gauge what is and isn’t working in my yard. Verdict: This has been extremely successful. 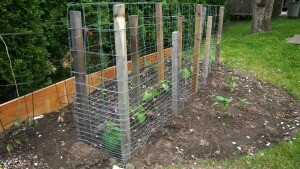 The vegetables inside the individual fences has so far remained untouched. ” and scattered the product on the whole perimeter of my back yard. I also put a little bit around my water melon and squash plants. if you want to try it. Once again, squirrels are a whole different story. This has been ineffective against the squirrels. I have have to build a cage to keep them out. The smell of garlic or onions is supposed to be strong enough to discourage groundhogs, squirrels, and raccoons from eating your vegetables if planted among your veggies. I have surrounded some of my vegetables with a line of red onions. Time will tell if it will repel groundhogs, squirrels, and raccoons from my yard. Verdict (updated): I have had mixed success with this method. 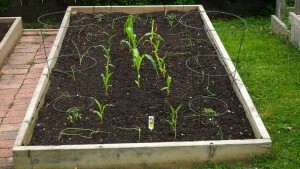 Two of my vegetable beds with onion borders remain untouched. One bed was dug up a little bit. I will give it more time before coming to a final verdict. As there may be more success once the onions have had time to grow a little bit more. It has now been a little over two weeks since I began this experiment and I can say that this method is not effective. The planter bed pictured above was completely destroyed by squirrels. I woke up to find most of the corn plants dug up and eaten. I had to build a cage to keep the squirrels out. live trap. It is about $90.00, but well worth it. live trap is a must have. It is simple, sturdy, and works great. 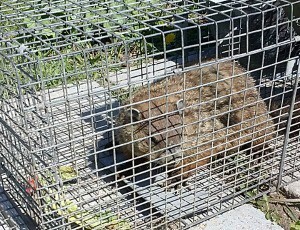 I have used it to trap a total of 4 groundhogs, 3 raccoons, 2 skunks. and even a few squirrels. Not a single animal was hurt while trapping. They were all safely relocated to a nice ravine. The main reason that groundhogs, squirrels, and raccoons will come to your backyard is that they are looking for food and your yard has been identified as a good source of food. Fallen fruits from fruit trees must be cleaned up as soon as possible. Scraps of food from lunch or dinner should also be cleaned up in a timely manner. Don’t give groundhogs, squirrels, and raccoons a reason to come to your backyard. Verdict: The jury is still out on this one. I have eliminated food left behind by the kids. I assume this has helped. The real test will be when my fruit trees start to drop their fruits. I’ll get back to you on this one later in the summer. Groundhogs, squirrels, and raccoons love a cluttered yard. Clutter gives them places to hide or make homes. I have eliminated clutter such as dead branches, old pots, old chairs, and anything that is not really needed anymore. I also trimmed back bushes and got rid of weeds that served as potential hiding spots. The whole idea is to make my yard less inviting to groundhogs, squirrels, and raccoons and discourage them from hanging out there. Verdict: This has definitely helped. The animals that I have seen in my yard quickly climbed out and over my fence. They no longer have a place to hide. Given time they will figure out that my yard is not a safe place to explore for food. I have read that keeping wind chimes and some of those spinning flywheels helps to discourage groundhogs, squirrels, and raccoons from messing with vegetables. I have added spinning flywheels and wind chimes to my yard. Verdict (updated): I’m not so sure this has any affect as I see birds landing beside them all the time. I do like how they look and how the wind chimes sound so I will keep them. As stated above, I have had to build a cage to keep the squirrels out. They seem to laugh at the spinning flywheels. 7 off the tips mentioned above had varying degrees of success. The fencing and live trapping provided the best and most immediate results. However, one can not stop at just fencing and trapping. 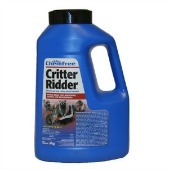 Other steps such as critter repellents, eliminating food sources(where possible), and reducing clutter must also be considered. With the proper preparation and a little perseverance you can manage the animals that live in and around your area and have a successful planting season. I will update this post later this summer with a progress report. Wish me luck and please post your stories of success or trials with groundhogs, squirrels, and raccoons. Fencing and live trapping have been extremely effective against groundhogs and raccoons. Squirrels have proven to be a much more challenging critter. With the experience I now have I have to say that the only way to truelly keep squirrels out is to build a cage.